WAIST HIGH: Paul Weller Designs MINI Cooper For Charity. 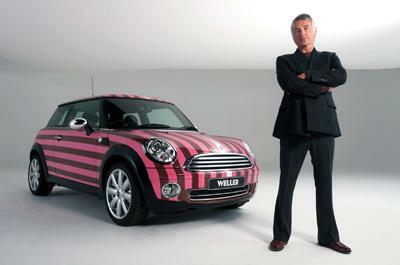 Paul Weller Designs MINI Cooper For Charity. The great Paul Weller has come together with one of the most iconic British brands of all time - MINI, to design and auction a unique car to raise money for Nordoff Robbins and War Child, two charities very close to Weller's heart. Weller said of the design: "I've always loved and driven Minis so when Mini asked me to be their ambassador last year, it felt a natural thing to do. I was given the opportunity to design my own Mini Cooper and the colours on the car were inspired by a shirt I designed for Ben Sherman that I loved a few years back. "Now that the car has been manufactured, I thought it would be good to give it to two charities that I support to help them raise some much needed funds. War Child is an amazing charity which works tirelessly to provide protection for kids who live in some of the world's most dangerous places - Iraq, Afghanistan, Uganda and DRC. "Nordoff Robbins is the charity that really uses music to transform the lives of kids and adults who are ill or disabled, helping them to engage and communicate with others. They're endlessly fundraising to help and support these vulnerable people." The online auction is open now until December 11.